I’ve recently revisited painting with watercolours. Not an easy media. But completely involving. An important step was to choose a subject to inspire. You can search hard looking for something far and wide only to discover that what you like best is closest to home. So I chose London and particularly the waterfront. There must be an affinity there! The views below include an unusual one from the Albert Embankment taking in the houses of Parliament and the London Eye, one of the skyline including St Pauls, and some of the Thames opposite the recently opened village in the sky which is the Shard. Others show a greener part of London – mainly in and around Highgate and Alexandra Palace. [the painting are shown here are all originals but are cropped and don’t show the whole image.] See contact page for how to buy and details of prices. In the image above you can see where, next to these railings on the Thames, the tourists in the garish yellow amphibious vehicles owned by ‘Duck Tours’, splash into the river and get their first waterborne views of at least two of the most iconic sights of London. If they listen carefully they can also hear the James Bond theme tune. Further down the river is a good view of Blackfriars – and more railings. This is just a little further down from the lovely Bankside Gallery, and, of course the Tate Modern, which is probabaly better known. These pictures focus on Thames barges, moored up two days before the typically damp days of a ‘mid summer’s’ London celebration. The shape of the Shard and the sail on the boat show some harmony. 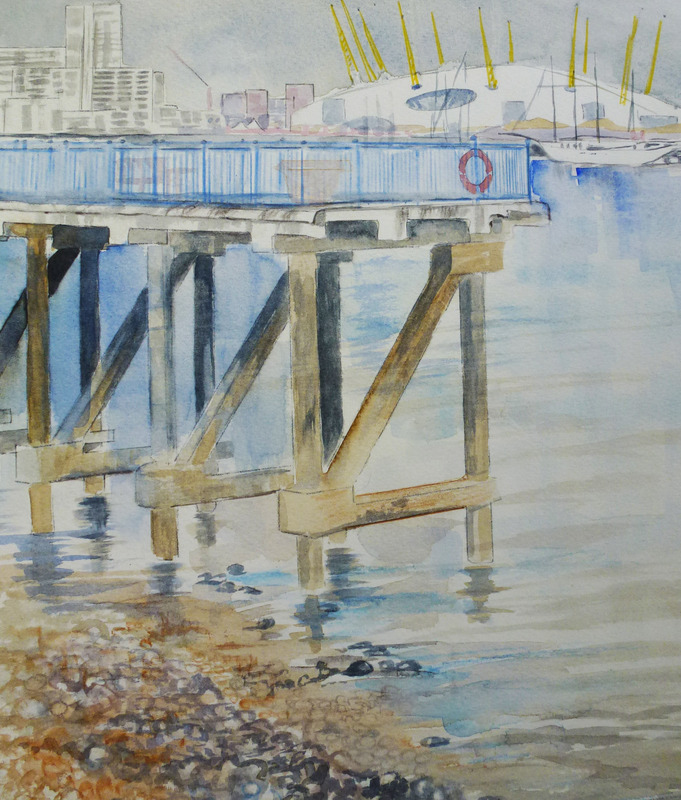 Other watercolours in this collection represent the park land side of London. The first two are of the Gove next to the Peoples’ Palace – Alexandra Park and Palace. The Grove facing the palace, shown in early Spring. Same trees but from a different direction. The last one in this section shows a small scene in Regent’s Park with a row of three very proud looking alium plants.